BRANDON, Man. – Despite veering away from her original plan to become a teacher, Carmen Miedema remains committed to helping others learn. A graduate of Brandon University (BU), Miedema is in her first year in the Archival Studies master’s program at the University of Manitoba (UM), where she received the Archival Studies Entrance Scholarship for the National Centre for Truth and Reconciliation (NCTR) last year. The scholarship will be worth up to $40,000 as Miedema works to transfer archives and information about Canada’s residential schools to the NCTR, located at UM. 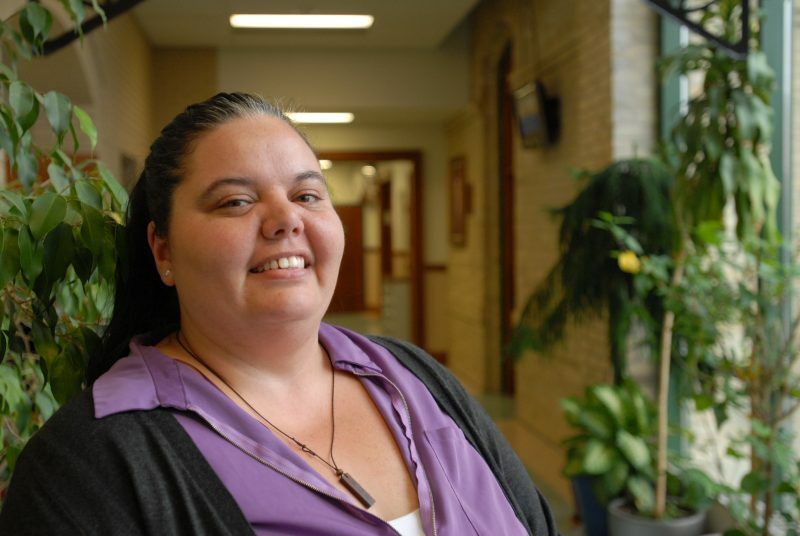 Brandon University graduate Carmen Miedema is working on a project to transfer archives about residential schools to the National Centre for Truth and Reconciliation. Originally from Peepeekisis First Nation, near Yorkton, Sask., Miedema is working on a unique project as the material includes oral traditions and oral history items that are not commonly considered archives. Miedema says that the uncommon nature of the materials has been one reason for a recent movement to have Indigenous people working on Indigenous archives. Miedema is proud to be involved in the effort to promote reconciliation between Indigenous and non-Indigenous people in Canada. “There’s a push to educate the public in general, and not so much about laying blame, but creating understanding,” she said. A mother of four, Miedema had been out of school for a long time before coming to university, and the promise of support and mentorship from her professors was one of the reasons that she chose BU. “In this small, tight-knit community, there was a professional relationship with professors, but at the same time you knew that they cared,” Miedema said. Conversations with her professors at BU helped Miedema realize she wanted to set off in a new direction. One those professors, Lynn MacKay, planted the idea in her mind that she might be happier working in a museum than teaching in a classroom. Miedema’s vision of her future continued to sharpen as she was introduced to archives in the Historical Methods and Historiography course. Department of History Chair Jim Naylor said Miedema’s passion was evident as she expertly wrote about Indigenous women’s history for the challenging fourth-year course, but noted she also showed interest in a wide variety of topics and the willingness to tackle difficult material. Miedema’s drive was also apparent to Denis-Paul Combet, the Department of Languages Chair at BU, who noted that she took a number of French-language courses at BU, developing her skills enough that UM waived the required French test for her master’s program. Miedema noted that her BU professors not only inspired her, but also her children, even offering guidance with their school projects. Her oldest daughter is now studying at the University of Alberta, and Miedema believes that her experience at BU helped to show her children the value of education. “My children see university as a turning point in your life and that they can make a difference,” she said.